This lesson gives a coordinate proof of the triangle midsegment theorem. What is the triangle midsegment theorem? 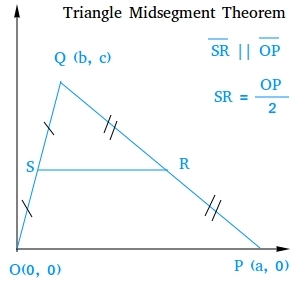 If a segment joins the midpoints of the sides of a triangle, then the segment is parallel to the third side and the segment is half the length of the third side. Consider the following triangle on the coordinate system. To prove that SR || OP, we can just show that their slopes are equal. To prove that SR is half OP, we can use the distance formula to find SR and OP.